A canine actor believing the "powers" depicted on his hit television show to be real heads out on a mission to deliver his co-star from danger. 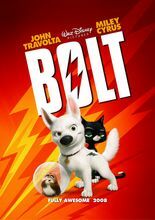 Bolt is a dog raised and thriving on the set of a hit television show depicting him using his "superpowers" (which, unbeknownst to him, are not real) to defuse a variety of outrageous situations alongside human co-star Penny. Shipped from his Hollywood home to New York City by accident one unfortunate day, a naive Bolt strikes up a friendship with stray cat Mittens, believing himself to be taking part in a mission to deliver Penny from the evil clutches of archenemy Doctor Calico as he seeks a way back to California.